So, here was “The Greatest Generation” finishing up World War II, welcomed home to great applause, and Ellery Queen writes a novel about that which includes, front and center, the issue of post-traumatic stress disorder. This is the second novel to take place in the idyllic upstate New York town of Wrightsville. Ellery has been invited back to investigate a twelve year old crime. Davy Fox is a returning war hero who has issues. 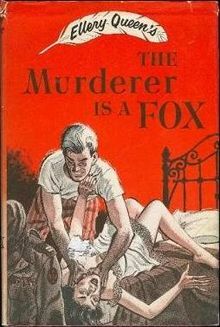 His wife is convinced that although his war experiences may have had something to do with his withdrawals and his mood swings, his problems really date back to when he was a young lad, the son of a man, Bayard Fox, sent away to prison for murdering his wife, the hero’s mother. Dear old dad has always maintained his innocence. Hero’s wife, Linda, figures if the Davy can come to grips with his childhood tragedy, if Ellery can find the real culprit, then the hero can re-enter society, overcoming any psychological problems caused by the war. So Freudian, so excusing of the horrors of war: with thousands of men returning, some scarred more than others, any problems surely had to pre-date the war, right? Fox refers to himself as “the killer they gave medals to.” The son of a killer. The guy who finds hi mself in the middle of the night fighting impulses to strangle his own wife. 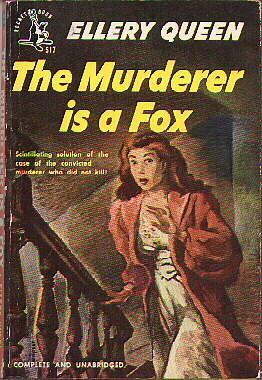 So, they get Ellery to investigate the old murder. Ellery is reluctantly game, explaining, “I must tell you, before we go on, that I don’t ordinarily waste my time and sympathy on husbands who try to strangle their wives.” He returns to Wrightsville, springs Bayard Fox out of jail, and returns to the scene of the crime. While there, many of the characters of Calamity Town appear, and new ones are introduced. We also learn about more food that Ellery disdains: “Ellery found himself facing the two excited spinsters across a table ghastly with the half-nibbled corpses of creamed chicken patties, Waldorf salad with ersatz whipped cream and maraschino cherry, and Miss Sally’s famous dessert specialty, Pineapple Marshmallow Nut Mousse.” Ghastly half-nibbled corpses! So, anyway, Ellery solves the case, to almost everyone’s satisfaction. Bayard doesn’t buy it, though, and so, after making the official explanation that the mother was unknowingly responsible for her own death, the truth is revealed. It’s not that Davy is the son of a killer, he is, indeed, a killer. But that information is to be kept silent, out of sight, like so many other things are swept under the rug, ignored, denied, after war’s end. Please tell me you did not just spoil the ending for readers. Please. Oh, but I did. This mystery is about the journey, not the ending. Read most of their works. Still debating about reading Dragon’ Teeth,House of Brass and Glass Village. 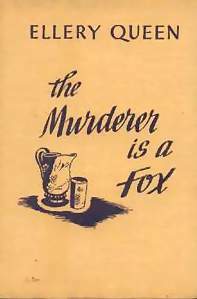 Even knowing the end, The Murderer is a Fox is one of their best. Glass Village, another Wrightsville social commentary mystery, is also quite good. House of Brass, which features a starring role for Richard Queen is enjoyable, and the Dragon’s Teeth is an interesting oddity in the canon. Well,having finished that I must say giving the solution is not really unfair because the solution is hardly the proof one finds in the other novels. Not the logic is always watertight but this is weak. Very iffy. Pure speculation on Ellery’s part. The solution is not as goofy as American Gun but that is not the problem. It is speculation not backed up by evidence. It is merely a possibility. Second anybody who goes into trances and strangles somebody else has serious problems. You cannot blame that on guilt or fear. He could have been making a mistake in lying to keep them together. I’ll have to reread this one soon.